It would be an understatement to describe Raffaele’s Pizza as a family-operated restaurant. As a child, the current owner, Bill Burns, would go to Raffaele’s after school to visit his father, eat pizza, and watch baseball games. When he was a teenager, he began working there and his first job was to watch the ovens. Eventually, he took over the kitchen. In 2009, Burns took ownership. Raffaele’s opened in 1974, and Burns’ father starting working there in 1976. The original owner, Raffaele Aquino, is no longer a partner in the business, but he and his family still visit regularly for pizza and sometimes stop by to get ingredients to make their own meals at home. Raffaele’s has been a staple of 19 North for more than 42 years. Many residents, like Burns, grew up eating there and now bring their own families to dine at Raffaele’s. Previous regulars who have moved out of Phoenix still make sure to visit when they are in town. Burns estimates that 70% of his customers eat at Raffaele’s at least twice each week, and a few of them come for both lunch and dinner. Out of respect for Raffaele’s loyal clientele, when Burns took ownership the only change he made to the menu was to add french fries, onion rings, and chicken strips. 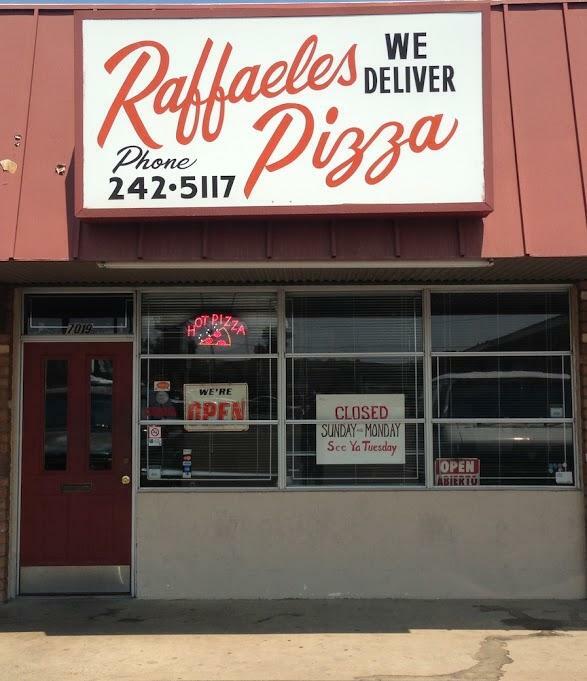 Raffaele’s is open Tuesday – Thursday from 11 a.m. – 9 p.m. and Friday and Saturday from 11 a.m. – 10 p.m. They have lunch specials daily until 2:30 p.m. and also offer a separate catering menu and local delivery. Stop on by! Yes Raffaele pizza is great.also anything they see is yummy. The staff that works there make you feel like family. Everyone should try it. Hey Cathy! Great article. We love Raff’s too! This has been my husband’s family’s pizza spot since we was a kid. It’s so funny because the only reason I saw this was because a high school friend I am Facebook friends with liked it. Keep up the good work Billy! Raffles pizza is one of the famous pizza destination in the city and their staff are very cooperating which reminds us of home and everyone should try their pizza. They also offer separate catering options and delivery options from door to door.